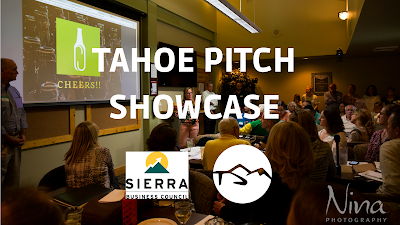 Sierra Business Council (SBC) and Tahoe Silicon Mountain (TSM) are excited to announce the return of Tahoe Pitch Camp and Tahoe Pitch Showcase, a series of workshops culminating in a showcase for Tahoe/Truckee entrepreneurs, startups, and founders to present to the community their innovative companies & ideas. On September 24th at 6pm at the Community Arts Center in Truckee, entrepreneurs will present their pitch deck for the chance to win prizes and receive feedback from an expert panel of judges, as well as the audience of community members. Tahoe Pitch Camp, a series of workshops delivered by Sierra Business Council, is designed for entrepreneurs to hone their skills, learn about successful pitch techniques, and craft a winning pitch. Taught by SBC’s Kristin York and other seasoned mentors in collaboration with Tahoe Silicon Mountain, participants will hone their presentation skills and information into a five minute presentation, referred to as a pitch, identifying their value proposition and their organization’s capital needs. The Showcase will feature the finalists of the entrepreneurs from the Pitch Camp. Entrepreneurs at any stage, startups, founders, and established businesses are all welcome to apply for Tahoe Pitch Camp and Showcase. The series, held at SBC’s office in Truckee, will begin on August 29th and continue on September 5th and 12th from 6-8PM. In addition to the classes, entrepreneurs are encouraged to take advantage of free one-on-one consulting with SBC’s Sierra Small Business Development Center staff. Kristin York is director of the Sierra Small Business Development Center, VP of Business Innovation at Sierra Business Council, and a Professor of Sustainable Urban Development and Implementation of Sustainable Business at Presidio Graduate School. Sierra Business Council pioneers innovative approaches and solutions to increase community vitality, economic prosperity, environmental quality, and social fairness in the Sierra Nevada. Our local Truckee/Tahoe/Reno entrepreneurs are coming together to sponsor the dessert and soft drinks at our 2nd Annual Pitch Showcase. We've set the sponsorship level at just $25 per company because it is our goal to have a show of force of how many startups we have. Sponsors are encouraged to submit a logo to be displayed on an Entrepreneur Sponsors slide at the Pitch Showcase. Company names will be commemorated on a keepsake can cooler that attendees receive. We hope that we can fill the can cooler with startup company names. Don't be left out, commit to sponsoring today!